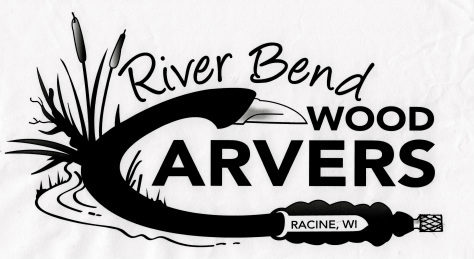 The "River Bend Wood Carvers" was founded in 1980 In Racine, WI as the "Wildlife Carving Club" and its purpose is to promote “the art of woodcarving”. The club has about 40 members from Milwaukee to Northern IL. We participate in several art & crafts show including the one held at Hawthorn Hollow on Green Bay Road in Somers,WI, near UW Parkside. Our meetings are held at 7:00 PM on the third Thursday of each month at River Bend Nature Center, 3600 N. Green Bay Rd., Racine, WI 53404. There are generally about 15 - 25 attendees at the meeting. The routine for the meetings is to have a carving session starting at 6:00, a business meeting at 7:00, refreshment break and then a demonstration if scheduled. If there is no scheduled demo, we have kind of a “Social Hour” and usually break up around 8:30 - 9:00. Guests are welcome at the meetings. We also have a Christmas Dinner and a Summer Picnic for the members and their families. At the Picnic, members bring a dish to pass and the club picks up the cost of the coffee/soda and the entree. The last few years our Christmas Dinner has been held at a local restaurant with the club picking up a major portion of the cost. Besides the help from the other members, one of the big advantages is the use of the club library. Over 125 pattern & reference books, mostly on wildlife (Yes, we do have a few on Santa’s too); over 40 video tapes on carving, painting & reference; a large collection of Wildfowl Carving & Collecting, Woodcarving Illustrated & bird reference magazines as well as lots of study birds, ducks, fish, bills & feet. Carving classes are held for members every so often. The last one was on carving an Owl and plans are in progress for sessions on carving a tropical fish and an antique decoy.